A Vision by Karim Rashid! Asus presented yet another 10.1 inch netbook at the Consumer Electronic Show (CES) with its Eee PC 1008P. The most striking innovation is probably the extravagant design by Karim Rashid, a US American designer, who is celebrated as "one of design's brightest stars". Functionality and haptics are to be focused on, whereas the IMR technology (In-Mold Roller) developed by Asus creates a very special coating. The Eee PC 1018P would be a better choice if you value power and features on your netbook but, in terms of style, the Karim Rashid Eee PC is the most striking we've seen. The netbooks in Asus' Eee PC Seashell series have always been among the best-looking models on the market. Asus' Eee PC 1008P Seashell Karim Rashid isn't the best netbook on the market. Arguably, almost any of the other machines in the Seashell range are superior. But, if you don't mind its limited battery life, and you really want a netbook that stands out from the crowd, it'll probably be right up your catwalk. The era of low end netbooks has gone. Much more attention is given to the design and look of new generations, to the point where manufacturers are calling in big name designers to lend their stamp. Well-designed, light and quiet, this Karim Rashid 1008P surprised us nicely. Its glossy, mediocre panel does however cost it a star on our rating. It remains a nice product to use and easy to transport. It would make a nice gift for someone! Most Netbooks are built around providing maximum value--packing a standard set of low-power components into a cheap plastic shell designed to attract price-sensitive consumers. We've seen a handful of more design-focused Netbooks, but a fancier outer chassis doesn't mean that much without upgraded performance. This sharp-looking version of the popular Eee PC Netbook has more RAM and a bigger hard drive than entry-level models, but features the same CPU and low-res display. Hot Pink is the theme of the Asus Eee PC Seashell 1008P Karim Rashid Collection netbook, sporting an unmistakable designer finish. In areas such as screen and keyboard, the Asus Eee PC 1008P remains as weak as its Seashell predecessors. But for its chosen audience, we’re sure this netbook will win hearts in its coral-bling Hot Pink finish. And exceptional battery life is a welcome plus – although you will need to swap batteries in the afternoon if it’s all-day computing you seek. ASUS Eee PC 1008P Karim Rashid netbook isn’t about the price, just like pieces of clothing made by top-class designers aren’t. Most portable PCs who pride themselves on their design ask the question whether their higher price is worth it. We cannot say that we share the dilemma this time around, though - this model is definitely worth its weight in gold and if you are even considering it, you should buy it, especially if it’s intended as a gift to a dear female person. 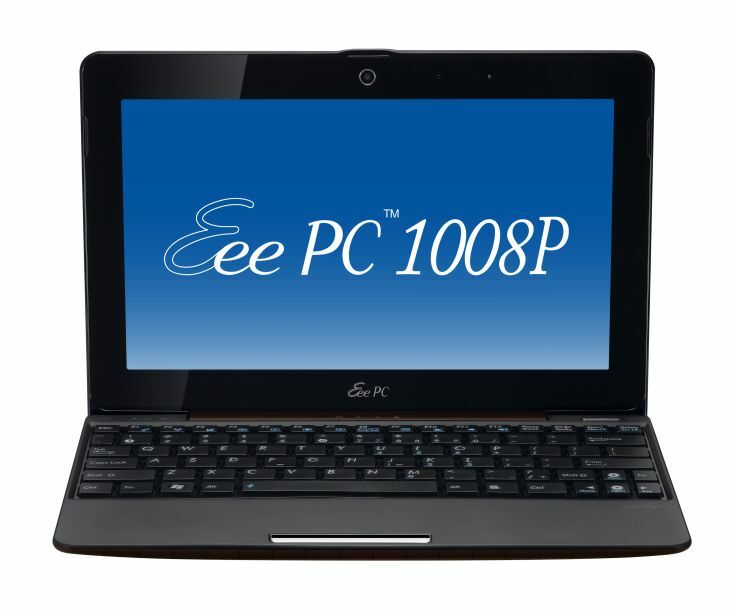 The Eee PC 1008P is the latest generation "premium" netbook from Asus. The company took help from famous designer Karim Rashid to add some of sort of uniqueness to its design. Along with the updated laundry list of internal components, the Eee PC 1008P is "Year 2010-ready". It's got almost everything right for a netbook; it's thin, lightweight, has a comfortable keyboard/touch-pad and decent battery life - thanks to the extra battery pack. The main gripe we had with the 1008P is the low screen brightness. Also, just two USB ports could be too less for some people. It's no surprise: In tech, as in so many things, you have to pay for pretty. An exceptionally designed netbook, such as the Asus Eee PC 1008P Seashell (Karim Rashid Collection), will generally cost a premium over an ordinary-looking model with the same hardware inside. This gorgeous, sturdy netbook has some excellent features, but at this price, its performance won't live up to every shopper’s standards. The Price (MRP) Rs. 26,990/-, which is surely expensive, and one gets the idea that they’re paying a premium for the glitterati factor. The performance results brims on and around the average results available these days from Pinetrail platforms. The life of one battery is very good on its own but some might find the idea of switching batteries on the go a little frustrating. Unfortunately, we think we have to add the 1008P to the list of laptops that suffer from performance issues at the expense of better design, like the HP Envy and Dell Adamo. While we love the textured chassis (in brown!) and think it's one good looking netbook, we can't justify paying more for less battery life. If we're going to pay $499 for a netbook, we'd take the Ion-equipped Eee PC 1201N that has comparable battery life to the 1008P, but much better gaming and HD performance. That's not to say the 1008P isn't perfect for those that are all about netbook beauty, but we're just doubtful that's the case for many people, and thus we don't see why you wouldn't go with a cheaper option like the 1005PE with its eight hours of battery life. Intel announced its new Pine View platform for netbooks just before Xmas and CES 2010 was awash with new models that made use of it. The first to hit the Mobile Computer office is the ASUS Eee PC 1008P Seashell Karim Rashid Edition but, as the name suggests, there’s a bit more to this netbook than a new processor. The Intel Pine View platform isn’t much to get excited about, but the Eee PC 1008P that’s wrapped around it is a really nice looking netbook that makes a refreshing change from the plain designs of other manufacturers. 71.44%: This rating is bad. Most notebooks are better rated. This is not a recommendation for purchase.